What happens when a foot doctor breaks his foot? Mostly people laugh at the irony. However, who better than a doctor of podiatric medicine and a pedorthist to develop an orthotic to help protect the injured foot and to hear the call to "Heal Thyself?" In 2007, Dr. King broke his foot — a bad 5th metatarsal Jone's fracture, for those of you that love foot doctor speak — while competing with his USTA Tennis and his Ultimate Frisbee teams. Knowing that the current foam-based shoes would not be stiff or protective enough for the job, he started utilizing advanced composite materials, including carbon fiber spring plates, to support and protect his foot. He found that putting a spring plate into a shoe was not enough. It took a moment of "Eureka" on the family ping pong table to move footwear and gait science truly forward. Using a lever under the spring plate to create an orthopedic shock absorber and mechanical lifting machine...? It was never done before, but it worked -- really well! So, here we are: 10 marathons and one phase 1 SBIR US Department of Defense and Army Medical Research Command testing contract later... completed on time and on budget. 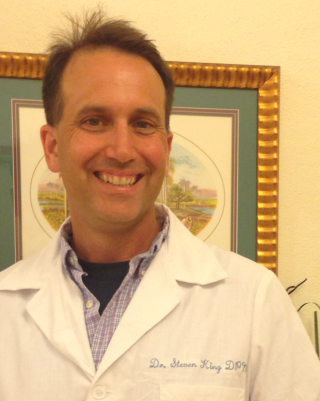 Dr. King is a past US Army Officer and Podiatrist -- he served in the Medical Service Corps. Dr. King earned his Air Assault badge at Schofield Army Barracks and fell in love with Hawaii (a great place to develop and test advanced footwear systems). Dr. King is a subject matter expert and voting member of the American Society of Testing Materials Committees: 1. Homeland Security Applications Personal Protective Equipment (E54.4) and 2. Pedestrian and Walkway Safety and Footwear Standards (F13). He is the only footwear maker on E54.4 and only podiatrist on F13. Dr. King suffered this 5th Metatarsal Jone's fracture while playing competitive adult recreational sports. Surgery was considered (a 6.5 canulated screw up the bone shaft) but ultimately was not needed when the new advanced Kingetics orthotic system helped heal and protect his broken foot. Dr. King used this setback as a spring board to become Co-Principle Investigator for Small Business Innovation Research contract # A11-109, "Advanced Composite Insoles for the Reduction of Stress Fractures," sponsored and funded by the United States Department of Defense and Army Medical Research and Materials Command. The boot-orthotic they produced from this research resulted in a reduction of combat boot weight by 30% , improvement against puncture by 300-1000%, and would not start on fire with horizontal and vertical flame testing. The Department of Defense responded in a rejection letter afterward stating "There is limited commercial potential for this application in the military." There has been no further "government" funded research since.